This is Book 2 of the Riyria Revelations. See my review of Book 1 here and Book 3 here. Avempartha picks up two years after The Crown Conspiracy ends and readers once again travel with Royce and Hadrian. This time, it's off to a tiny village situated close to a massive waterfall and Elvish tower (called, as you might guess, Avempartha) where they have agreed to help a girl's father defeat a massive flying demon that is attacking the village. There they meet some old friends and make some new ones and learn a great deal more about the history of their world and what may be coming to pass soon. It is very difficult to write a plot summary for a book that is in the middle of a series, and even harder to then review the book without giving away spoilers. So I'll try to keep this general and simple. In my review of The Crown Conspiracy, I mentioned that this series uses modern language, which I find a bit odd in a fantasy novel. I then felt bad as it seemed like most people focused on the language instead of my comments on how much I enjoyed the book. Here, it's the same. Yes, there is modern language, but now I am used to it and it did not detract from the story. There are elves and dwarves and wizards in this book and each race has its own language, much like in The Lord of the Rings. So making comparisons is pretty easy. But I think if you read this book, you'll get over the language pretty quickly and focus on the story. The author, Michael Sullivan, states that each book can be read on its own without needing any of the other books to understand it, but I am not sure how that could possibly be the case going forward. This book ends with the book's plotline cleared, true, but also with a lot of other plots wide open. I don't see how anyone could read it and not think that there was a sequel to be written. And going forward in the coming books, I imagine that will be more and more the case. But I'm willing to go along for the ride. I can't even say what about this book I enjoyed so much, but I was completely absorbed by it. When I describe the plot above, it seems straightforward. And I guess it is. But it's told in a very compelling way. It's so refreshing to read a fantasy novel without all the gloom-and-doom, that takes time for humor. This series of books does just that. It has easy-to-like characters, satisfying "in-book" plots, and a compelling over-reaching plot. There is also a good amount of information provided and hinted at to the reader about the world's past. I love that in epic fantasy. I like an author who writes out his world's entire history and mythology before writing his books, so that the reader can become steeped in the world. One scene that made me slightly roll my eyes was near the beginning, when one female character was being more dramatic, in my opinion, than necessary. Another small quibble I had was the level of insight some characters would have into other people that they didn't know very well. It was almost like someone would say, "Hello, my name is Joe," and the character being spoken to would say, "I know you want to ask me about my knowledge of your long-lost second cousin once removed, so go to it." I exaggerate, but it seemed to happen a couple of times to move the plot in a slightly forced way. If you don't read much epic fantasy but want to give the genre a try, I think this would be a great series to start with because of the language and the humor. While I thoroughly enjoyed The Blade Itself, I'd say that's not the sort of book to start for a foray into fantasy. This series is. It's fun, the books aren't obscenely long, and supposedly the entire series (though we have been promised this before!) is written and ready to be published. Often with epic fantasy, the problem is the years of waiting between books in a series (see Scott Lynch or George R. R. Martin). These books won't have that problem. This series has really inspired me to look more closely into small press publishers, too; there are so many books out there that don't have the marketing pull to get a wide audience, but that really, really deserve the attention. This is one of those books. If you enjoy fantasy, you'll probably enjoy this series. I highly recommend checking it out. The third book is already out, and the fourth should be available in April. The fifth is scheduled to be released before the end of 2010 and the last installment early in 2011. I haven't read much fantasy because I tend to feel like the writing can be hit or miss and sometimes the fancifulness of the plots makes me a bit skeptical as to if I would enjoy a particular book or not. But I have been paying close attention to your reviews of these books and think that the modern language may actually be a plus for me in this instance. I am also kind of psyched that the books will be published so close to each other because I hate waiting for a series to get to print while I am in the middle of reading it. I am going to tentatively put these books on my wish list. They sound interesting and your reaction to them is a selling point as well. Great review, I am glad these books have kept you so engrossed! I hope they will do the same for me! I didn't read your full review because I haven't read the first book, but I'll definitely keep an eye out for this series! 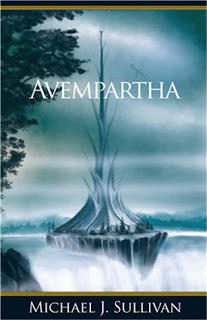 While the first book was pretty good, Avempartha really brought the plot together for me and made me fall in love with all of the characters. While the tone and worldbuilding of the series so far is light, I have a feeling that the series as a whole is going to be a new take on epic fantasy. Well played Mr. Sullivan, I look forward to the rest of the Riyria Revelations!